Getting your children to sit down and do their homework can be a battle. Little ones progressing through grade school may be encountering work outside of the classroom for the first time, while children in middle or high school must learn how to balance homework with extracurricular activities, a busy social life and part-time jobs. As a dad, you'll likely want to help out and ensure that your kids are understanding their assignments without giving away the answers. Here are some tips to help you strike that balance. Regardless of age, children should become (mostly) self-reliant and motivated when tackling homework and larger assignments, but they need your help to get there. Establishing a regular homework routine will help instill these practices in your children for efficient time management and quality results. Insist that homework begin as soon as children get home from school so that they're still in the right frame of mind for learning – allowing for other activities only after they complete their assignments. 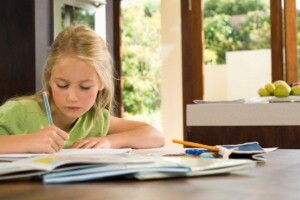 As with any type of assignment, children require a quiet study area conducive to completing homework. This space can be a kitchen table or bedroom desk – so long as it is well-lit, free from distractions and stocked with school supplies. These days, students may also require a computer to complete some tasks. If this is the case, KidsHealth.org recommends placing it in a common area, where distractions like surfing the internet, playing video games or chatting with friends are less likely. Even with these techniques, your kids are going to need encouragement and assistance from time to time. Check in at the beginning of their study session to see what assignments they have to complete and be available to answer any questions that may come up. When your kids are done with homework for the night, check again to make sure they didn't have any problems and that they're on schedule with larger projects.